Helen is a textile artist. 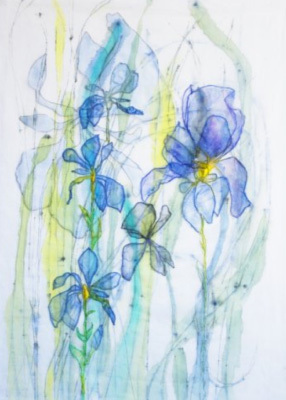 She uses fine silks, organdie, muslin and paper with threads, pressed flowers and paint. Her work is influenced by her garden, woods, fields, rivers, literature and family happenings. She attempts to capture sights, moods and thoughts, then translate them into delicate hand and machine embroideries. Often these appear to have a Japanese influence. She likes sweeping curves, emphatic lines and 3D effects. She is interested in opposites, such as tension and relaxation, strength and frailty, dark and light. Her aim is to create harmonious and elegant compositions.